Our conversation leads us to the mystic Meister Eckhart; R. begins to read a sermon by him, which fascinates us to the highest degree. Everything turned inward, the soul silent, so that in it, God may speak the hidden word! The absence of all ideality brings the soul blissful peace , says R., and the way to this peace is through Jesus Christ. Talked with R. about Buddhism and Christianity. Perception of the world much greater in Buddhism, which, however, has no monument like the Gospels, in which divinity is conveyed to our consciousness in a truly historic form. The advantage of Buddhism is that it derives from Brahmanism, whose dogmas can be put to use where science reveals gaps, so far-reaching are its symbols. The Christian teaching is, however, derived from the Jewish religion, and that is its dilemma. Christ's suffering moves us more than Buddha's fellow-suffering, we suffer with him and become Buddhas, through contemplation. Christ wishes to suffer, suffers, and redeems us; Buddha looks on commiserates, and teaches us how to achieve redemption. 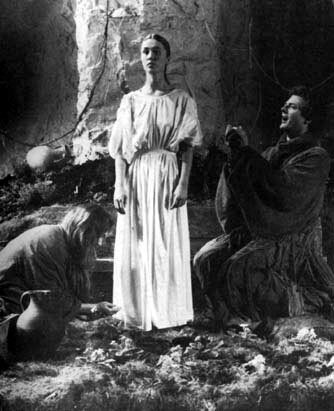 Above: Karin Krick as the female Parsifal in H-J. Syberberg's film. A warm and sunny Good Friday, with its mood of sacred solemnity, once inspired me with the idea of writing Parsifal; since then it has lived within me and prospered, like a child in its mother's womb. With each Good Friday it grows a year older, and I then celebrate the day of its conception, knowing that its birthday will follow one day. n Wagner's poem it is on Good Friday that Parsifal arrives at the edge of the forest with the Spear and with a burden of guilt. Here Wagner seems to be following his sources, in which Perceval or Parzival, who had not been inside a church or made confession in several years, met some pilgrims who were shocked to see him wearing armour on the holiest of days, Good Friday. They directed him to an old hermit whom they had just visited. In Wagner's drama the old hermit is identified with the knight Gurnemanz. Parsifal's guilt is only increased when Gurnemanz tells him of the death of Titurel and of the decay of the Grail community. who brought this woe on all! Good Friday Spell, orchestral version; Bayreuth Festival Orchestra conducted by Siegfried Wagner; recorded in the Bayreuth Festspielhaus in December 1926. Ogg format, mono, duration 11 min. Left: Kundry and Parsifal with the Holy Spear on Good Friday, Franz Stassen, 1901. Above their scene in the meadow, the artist shows angels collecting Christ's blood in the Holy Grail. According to the Sata-sáhasriká Prajñapáramitá, a bodhisattva shows his karuná [usually translated as compassion or fellow-suffering] chiefly by resolving to suffer the torments and agonies of the dreadful purgatories during innumerable æons, if need be, so that he may lead all beings to perfect Enlightenment. He desires Enlightenment first for all beings and not for himself. He is consumed with grief on account of the sufferings of others, and does not care for his own happiness. He desires the good and welfare of the world. It is still Good Friday as the final curtain comes down on Wagner's Bühnenweih- festspiel and Good Friday still symbolises Christ's sacrificial act on behalf of humanity; and it is entirely characteristic of Parsifal that he effects the miracle of the return of the Spear on the holiest of all days, without knowing it was that day until Gurnemanz told him. 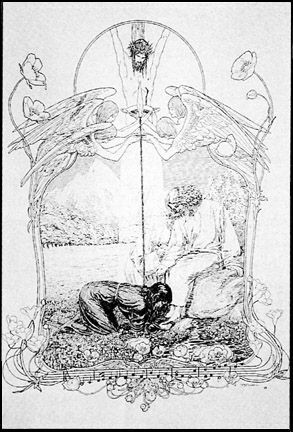 There is thus a reciprocal, mutually interactive connection between Parsifal and the Grail (already observable in Act 1) and between the Spear and the Blood in the Holy Chalice; and as Parsifal prepares to ascend the steps of the shrine to take the Chalice from the boys who have already opened the Holy Shrine in preparation for this moment, the point of the Spear glows red in mutual attraction and empathy with the Blood in the cup. ichael Tanner, in his essay The Total Work of Art, regards Parsifal as being a work about religion, more precisely the psychopathology of religious belief. He suggests that the words of Gurnemanz are addressed, not to Christ, but to Parsifal as man redeemed and transfigured. There is a certain tidiness about this view of the text, in which Parsifal not only restores the power of the Grail to intervene in the human world, but becomes a new Christ, one that does not die. This interpretation seems to be adopted in productions in which Amfortas shares the same fate as Kundry: Wieland Wagner suggested that this was necessary for reasons of symmetry. It is also consistent with some of the medieval sources, in which Anfortas is a symbol, or type, of Christ and the unseen Titurel is a symbol of the hidden Creator. In this symbolic interpretation of the Grail legend, the Grail bearer (Wolfram's Repanse de Schoye) is a symbol of the Virgin Mary, who bears the Grail, which represents the body of Christ. anner's interpretation seems to stretch the text too far, however: Gurnemanz's words are clearly about Parsifal but addressed to the once-suffering Redeemer. 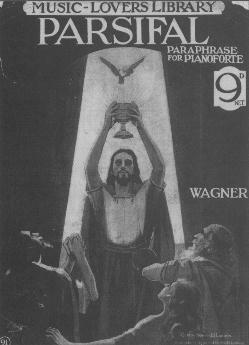 Wagner's letter to King Ludwig of 7 September 1865 is evidence that the composer related Parsifal to Christ, but not that he identified his hero with Christ; Wagner repeatedly denied that Parsifal was a Christ figure. It is true that the religious symbolism reinforces the relationship between Parsifal and Christ: in the last act, the episode of the Magdalen and the dove descending, as at the baptism of Christ in St. John's Gospel. So it was natural that Parsifal should be represented as a Christ figure in the first productions outside Bayreuth, productions which treated Parsifal as a religious work rather than a work about religion or as a non-religious work employing the symbols of religion. The composer's instructions do not imply an identification between Parsifal and Christ, nor do they indicate that Amfortas should die - as in Wolfram, at the end of the opera he is restored to health and lives on. To some extent the symbols have moved into the foreground, obscuring the meanings that Wagner had intended to convey to the audience. Therefore it would seem to be justified to reduce or remove some of the religious symbolism, as some recent productions have done. nother view of the work is that it is about spirituality rather than religion. The elements of mystical Christianity and Buddhism give the work its tension between redemption through the suffering of Christ and redemption obtained by following the Buddha down the path of enlightenment. Wagner was also interested in oriental religion and spirituality, for example in the poems of the Sufi mystic Hafiz. Parsifal's enlightenment seems to come from within, from God within our hearts, - God whom we comprehend in the deepest anguish of fellow-suffering speaking the hidden word . [Wagner was] still convinced of the pain inherent in being alive, and of the sovereign value of the identification of one's own sufferings with those of others. It is only in terms of this ethic of compassion, founded on a metaphysic of the unity of living things, that Parsifal makes sense. As soon as one has grasped that, the apparently Christian elements in the work, which can be embarrassing or seem merely added for colour, function much more actively as constituents in a profound drama of spiritual awakening and fulfilment. New life is brought to the Grail community, and it will be able to continue, invigorated, not through any injection of supernatural energy-boosters, but through the radiant example of Parsifal, showing the possibility of emerging triumphant from gruelling ordeals, neither complacent in his achievement nor exhausted by it.